More than 22.4 million people applied in 2017 to a U.S. visa program that provides 50,000 green cards, or lawful permanent residence, each year through a lottery system, according to a Pew Research Center analysis of U.S. State Department data. The number of applicants nearly matched the record 23 million applicants received in 2016 and came as the Trump administration and some members of Congress have sought to eliminate the program – the only one of its kind globally. Since 2005, more than 200 million people from countries around the world have applied for the program, known as the U.S. diversity lottery, which seeks to diversify the nation’s immigrant population by granting visas to immigrants from nations that are underrepresented among recently arrived immigrants. 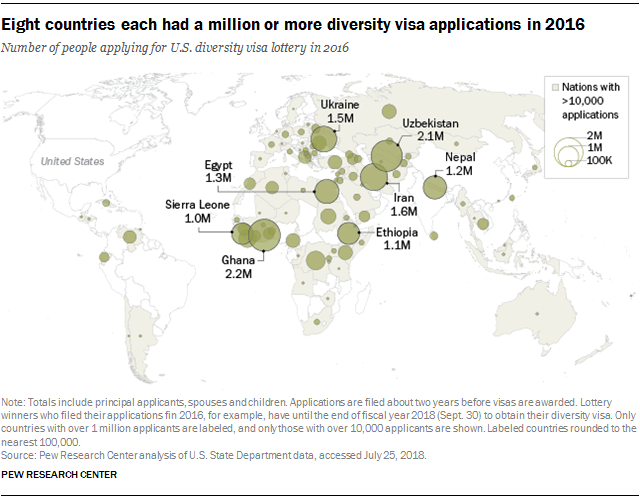 In some countries, a significant share of the population applied for the diversity visa lottery in 2016. In Liberia, for example, nearly 15% of the country’s citizens applied for the program. Other African countries with high shares of applicants included Sierra Leone (14%) and Ghana (8%). European countries such as Albania (13%), Moldova (11%) and Armenia (9%) also saw substantial shares of their populations submit applications. In Asia, Uzbekistan (7%) and Nepal (4%) had the region’s highest shares on this measure. Overall, nearly 1% of people in eligible countries applied for the program. Among diversity visas actually issued, the regional breakdown of where immigrants come from has changed over time, according to U.S. State Department figures. (The department sets regional quotas annually based on how many immigrants from a region have come to the U.S. in recent years.) When the diversity lottery first started in fiscal year 1995, citizens of European countries, including those that were part of the former Soviet Union, received the largest number of diversity visas (about 24,000). In fiscal 2017, which ended Sept. 30, the largest number of visas went to citizens of African countries (about 19,000), while applicants from European countries (nearly 21,000) and from Asia (almost 8,000) received fewer visas. Those eligible for the lottery face few barriers with the initial application, which has no fee, is available in many languages and asks for limited personal information. If selected for a diversity visa, however, applicants must submit to detailed background and security checks, interviews and health screenings and pay $330. Upon entry into the U.S., diversity visa recipients are given lawful permanent residence status, which gives them permission to work and live permanently in the U.S. 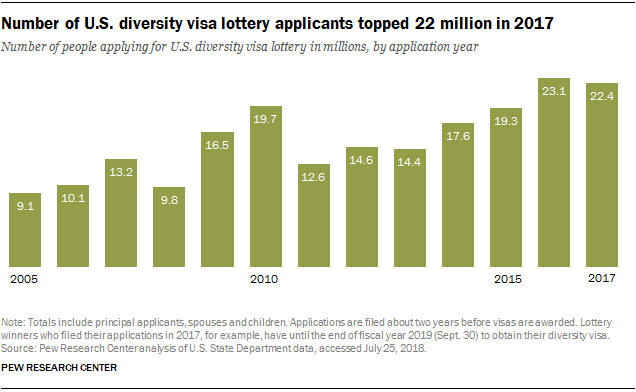 The biggest restriction of the diversity visa lottery is that the applicant or their spouse must be citizens of countries that have sent fewer than 50,000 immigrants to the U.S. over the previous five years. As a result, those from Mexico, Canada, China and India –top origin countries for U.S. immigrants in recent years – are not eligible. The list of eligible countries can change each year. For example, due to increased immigration to the U.S., citizens of Bangladesh became ineligible for the lottery starting in 2011, and those from Nigeria became ineligible since 2013. Others can gain eligibility for the lottery if immigration to the U.S. slows, as was the case with citizens of Russia who became eligible beginning in 2008, while those from Poland could apply starting in 2012. Note: This is an update of a post originally published March 24, 2017.